I love Izakayas. It is no secret if you read this blog often enough. As much as it isn't supposed to be a "meal", we often find it as such in Vancouver. For some odd reason, most of my Izakaya forays seem to include Vandelay and Rich Guy. To change it up, Miss Y graciously accompanied me to Manzo Itamae in Richmond. Hey, I don't mind this arrangement because Miss Y looks a whole lot better than Rich Guy and Vandelay (sorry guys...). As with any Chinese-operated Izakaya/Japanese restaurant, we need to go in with reasonable expectations. There will be certain liberties taken on certain dishes and the menu will included things normally not seen in an Izakaya. However, with that being said, Izakayas are already "different" than the ones we find in Japan anyways. Miss Y spent a significant amount of time in Japan and she basically echoed this sentiment. In fact, she doesn't believe that there are any Izakayas in Vancouver that can truly represent the real thing. Then again, we deserve the restaurants we have because they appeal to the taste of the locals. 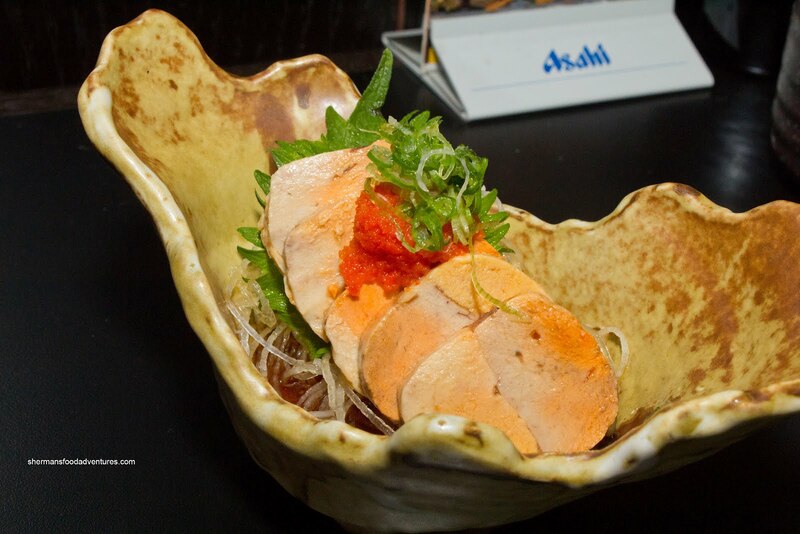 For our meal, we started with the Ankimo (monkfish liver) which was served with the usual chili daikon radish and ponzu sauce. Often referred as the foie gras of the sea, this is probably the best way to describe the texture and taste of ankimo. It is more stiff and less buttery than foie. Furthermore, there is a definite seafood flavour as well. There was nothing amiss with the actual liver in our order, however, the ponzu was slightly too acidic. 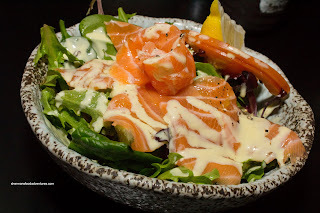 Next, we had the Salmon Sashimi Salad. This, to us, was pretty average. Don't get me wrong, it wasn't terrible, it was just "meh". The salmon was a touch soft while the dressing didn't offer up any impact. We probably would've enjoyed it more if there was a vinaigrette of some sort. 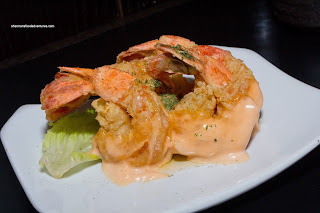 For me a visit to an Izakaya would not be complete without an order of Ebi Mayo. I liked how they did not use too much batter on the large shrimp. They were fried perfectly where the exterior was crisp while the meat still exhibited a snap. Therer appeared to be a chili mayo, but it was more sweet than anything. 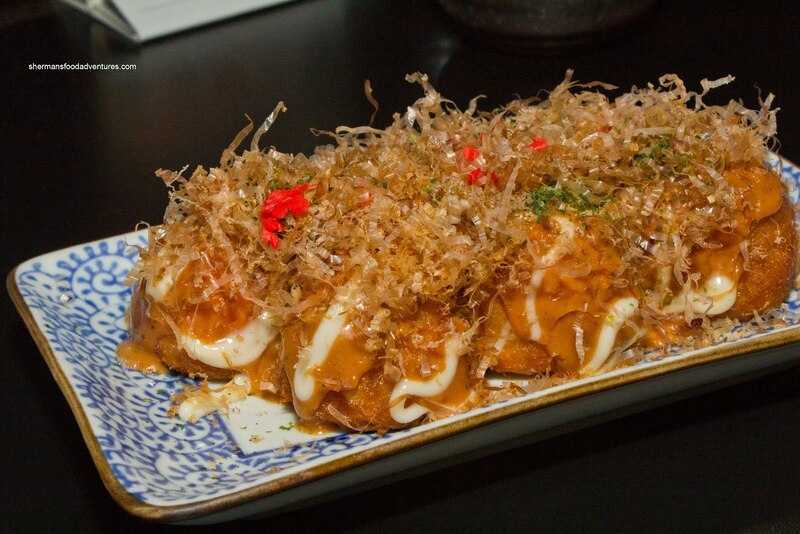 Another one of my favs is the Takoyaki or octopus' balls. Before the giggling starts, this was not really what you think. Rather, it is mix of batter with pieces of octopus formed into a ball and cooked in a specially made mold. Usually, it is topped with sweet mayo, unagi sauce and bonito flakes. In this case, the sauce appeared to be a sweet chili mayo concoction with lots of bonito flakes/shreds and ginger. Despite the colour, it wasn't spicy, rather it was mostly sweet and tangy. The takoyaki itself were fluffy and overall, it was enjoyable. 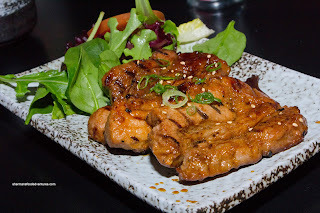 Other than the Ankimo, which was one of the featured items for Fridays, we had the other one being the Pork Ribs. These were some pretty meaty ribs with few bones. The meat was mostly tender except for a few parts. We would've liked to see more char (although there was some char in spots) since those were the most flavourful parts. We liked how there was a good amount of spice. 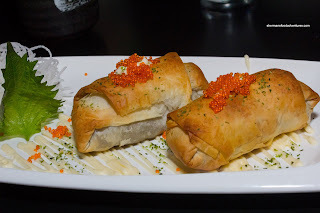 An intriguing item on the menu was the Phyllo Duck Rolls. They arrived golden brown and steaming hot. I liked the disintegrating flaky phyllo on the outside because the opposite would be soggy undercooked phyllo. There was a decent amount of moist, tender duck inside with a bevy of veggies. I found the entire thing a touch bland and lacking in texture. If there was some crunch, it would be made more of an impact. With that being said, we didn't dislike this dish either. 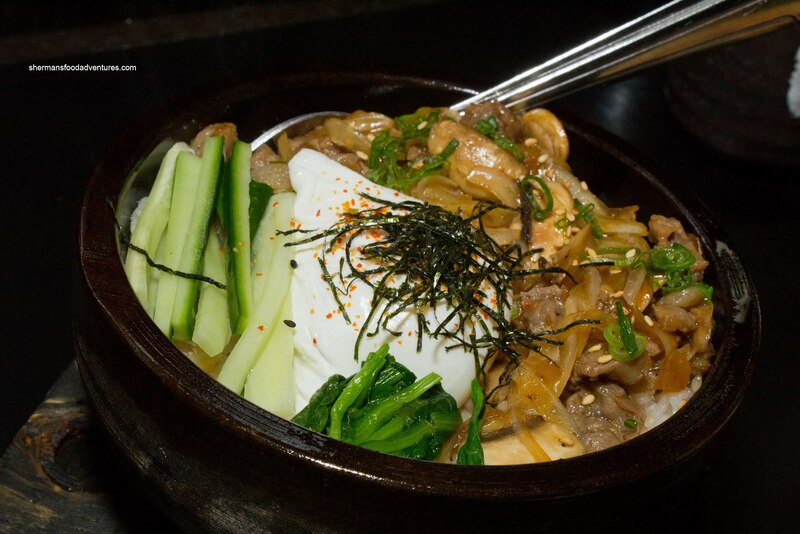 Onto the fillers, we started with the Korean Shortrib Bibimbap served in a hot stone bowl. For me at least, this was a fail. First, the rice was extremely wet and even the hot stone bowl couldn't save it. In fact, a rice crust didn't even materialize. As for the shortrib, it was pretty bland with only a touch of sweetness. It was also wet, which only compounded the issues with the rice. We didn't end up finishing the rice and frankly, I really had no interest in eating any more of it in the first place. 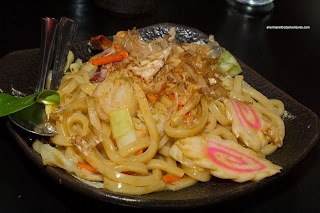 For our second starch-ladened dish, we had the Yaki Udon. Compared to the bibimbap, this was a roaring success. Well, relatively that is. I thought there was a good balance of flavours of savoury and sweet. With a proper amount of cabbage and carrots, there was a good crunch to go with the chewy udon noodles. Moreover, the fry pan or flat top was hot enough to produce some caramelization and kept the dish from being wet at the same time. 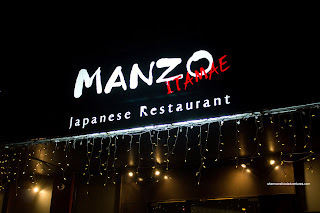 As I am writing this post, I must admit at being torn about Manzo. The prices are quite high if we compared it to other Izakayas. Furthermore, there are some which will cry foul that it is not a true "Japanese" run operation. Yet at the same time, most of the dishes were above average. In addition, we found the service to be top notch and attentive. They changed our dishes like 5 times! 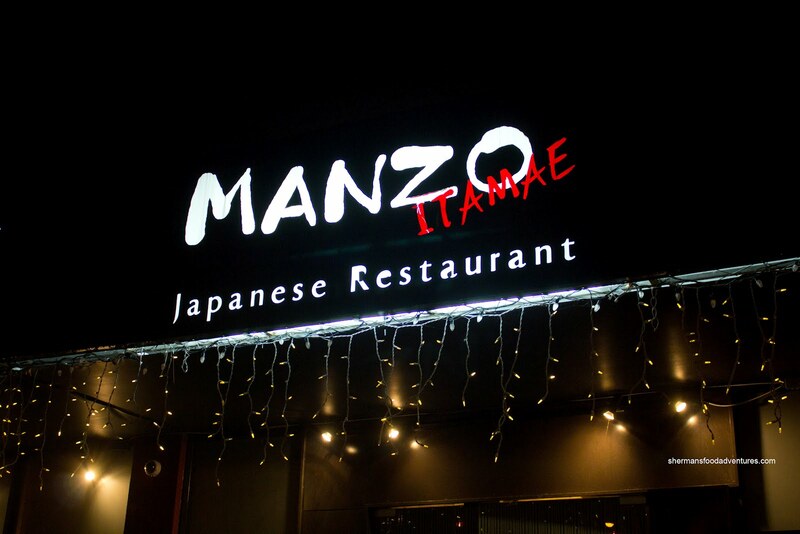 In the end, Manzo is an okay place to satisfy your Izakaya-cravings.